Reports published in American Journal of Clinical Nutrition by the University of Ulster Scientists reveal that 'eating watercress daily can significantly reduce DNA damage to blood cells which is considered an important trigger in the development of cancer'. A prominent member of the cabbage family, watercress is one of the oldest leaf vegetables consumed by human beings. 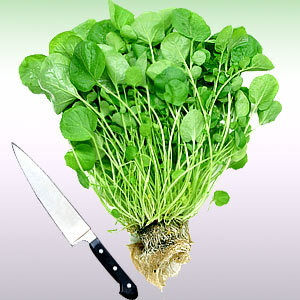 Watercress is botanically related to garden cress and mustard, all of them known for their natural peppery tangy flavor. This rich flavored green leafy vegetable is store house of many phytonutrients that have health promotional and disease prevention properties. One of the very low calorie green leafy vegetables (11 kcal per 100 g raw leaves) and very low in fats; recommended in cholesterol controlling and weight reduction programs. Cress leaves and stems contain gluconasturtiin, a glucosinolate compound that gives peppery flavor. Research studies suggest that the hydrolysis product of gluconasturtiin, 2-phenethyl isothiocyanate (PEITC), is believed to be cancer preventing by inhibition of phase I enzymes (mono-oxygenases and cytochrome P450s). Fresh cress has more concentration of ascorbic acid (vitamin C) than some of fruits and vegetables. 100 g of leaves provide 47 mg or 72% of RDA of vitamin C. As an anti-oxidant, vitamin C helps to quench free radicals and reactive oxygen species (ROS) through its reduction potential properties. Lab studies suggests that regular consumption of foods rich in vitamin C helps maintain normal connective tissue, prevent iron deficiency, and also helps body develop resistance against infectious agents by boosting immunity. It is one of the excellent vegetable sources for vitamin-K; 100 g provides over 200% of daily recommended intake. Vitamin K has potential role bone health by promoting osteotrophic (bone formation and strengthening) activity. Adequate vitamin-K levels in the diet helps limiting neuronal damage in the brain; thus, has established role in the treatment of patients suffering from Alzheimer's disease. Cress is also excellent source of vitamin-A and flavonoids anti-oxidants like ß carotene, lutein and zeaxanthin. It is also rich in B-complex group of vitamins such as riboflavin, niacin, vitamin B-6 (pyridoxine), thiamin and pantothenic acid that are essential for optimum cellular metabolic functions. It is also rich source of minerals like copper, calcium, potassium, magnesium, manganese and phosphorus. Potassium in an important component of cell and body fluids that helps controlling heart rate and blood pressure by countering effects of sodium. Manganese is used by the body as a co-factor for the antioxidant enzyme superoxide dismutase. Calcium is required as bone/teeth mineral and in the regulation of heart and skeletal muscle activity. Regular inclusion of cress in the diet is found to prevent osteoporosis, anaemia, vitamin A deficiency and believed to protect from cardiovascular diseases and colon and prostate cancers.